If you’ve never been there, Montana is a HUGE state. It takes 8+ hours to cross it when traveling 80mph (the posted speed limit) and that’s on the freeway. It’s an absolutely beautiful state though. I never realized how many mountains crisscross their way through the rolling prairie. Montana DOT could do with some better signage though. Several times we had to turn around and retrace our steps to find the correct turn–either due to a complete lack of or fairly unclear signage. Frequently there would be large signs pointing the way when coming from one direction; and little to no signage when coming from the other. It was also often difficult to decipher which “turn ahead” was the right one–one time it would be the turn DIRECTLY after the sign while others it would be 3 turns later after passing numerous side streets. Services information was also lacking. We limped the car into Missoula the first night as we failed to realize how far the distance would be on the Interstate between reliable gas opportunities–fortunately gravity was on our side as a steep grade downhill ushers you into town and the Subaru gets good gas mileage. At least South Dakota provides some warning in these situations with billboards containing messages such as “gas now or gas can later”. Montana also has a habit of closing rest stops with little or no warning which is especially problematic when each rest stop can be more than 50 miles apart! Glacier is a beautiful park, as is the surrounding area. It wasn’t nearly as crowded with visitors as Yellowstone–though as we learned later being there at the end of June put us at just the beginning of the very short summer season. Several hiking trails in the higher elevations were still closed due to snow hazards. Part of the reason it isn’t nearly as crowded as other National Parks is that it is, quite literally, in the middle of nowhere. West Glacier (the western terminus) is almost 140 miles from I-90–it took us over 3 hours to drive that distance on winding mountain roads, sometimes traveling 15 mph lower than the posted speed limit while following large RVs. St. Mary (the eastern terminus) is almost 90 miles from I-15. The drives are beautiful though. I actually recommend arriving at the park from the East side (driving up through the prairie) as you’ll have a commanding view of the Rockies for a much larger portion of the drive. If you come into the park from the West the overall drive is prettier–complete with mountain lakes and twisting curves–but the mountain views are largely obscured by trees and other, smaller hills. We were also surprised at the limited access to everyday services of this high-tourist area. 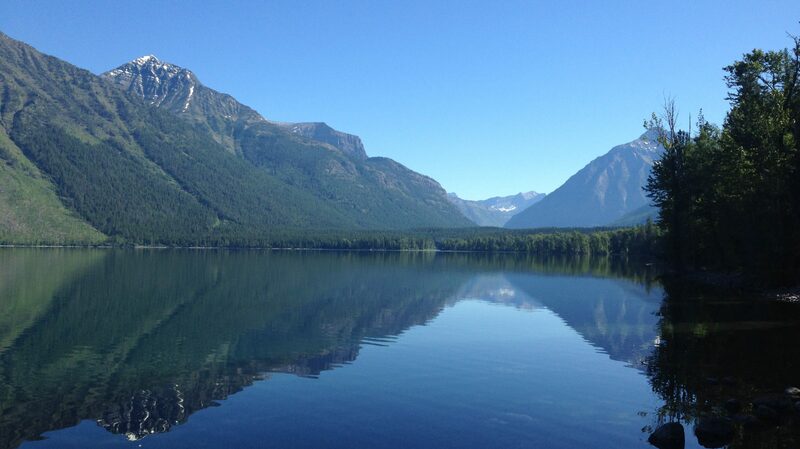 Both West Glacier and St. Mary’s appear to be reasonably sized towns based on the map (and their proximity to the Park)–and they are decently sized as towns in Northwest Montana are concerned–but they lack many basic services. I personally required some OTC medication thanks to side effects of antibiotics and we had to travel an hour out of our way to finally locate a pharmacy to acquire it (a feat that would have been accomplished in about 5 minutes in most other rural parts of the country). So something that should have been nothing more than a temporary annoyance ended up causing a real hindrance to the enjoyment of the trip. Having never been to the area before, my early online research made St. Mary appear to be far more commercialized than West Glacier; the map indicated this as well. It wasn’t. St. Mary consisted mainly of one gas station/small supermarket/restaurant/gift shop and a smattering of campgrounds and roadside cafes. West Glacier at least had 2 separate gas stations and several restaurants/shops within walking (or a short driving) distance. I don’t say these things to complain, you are in the wilderness after all, but more as a caution for preparedness. The park consists largely of the East and West termini and a road connecting the two through the mountain passes (the Going to the Sun Road) that’s only open about 4 months of the year. The rest of the year it’s buried under up to 30 feet of snow (near the summit) and is frequently plagued by avalanches. While the two towns are only 50 miles apart it can easily take 3 hours or more to cross the divide (due to other drivers, the slow speed limit forced by sharp turns and steep inclines and frequent stops at the many lookouts along the way.) It’s an absolutely awe-inspiring view though and I highly recommend taking your time to fully enjoy your surroundings…and possibly stop for a picnic lunch! Stop at the turnouts and enjoy the roar of the water filtering up through the canyon; the smell of the sweet, clear mountain breezes; notice the contrasts in color of the deep grey-brown/red rock; the blindingly white snowfields of the higher elevations all standing out against the vibrant green foliage of the lower altitudes as the dome of the sapphire blue sky crowns it all. While not as crowded as other parks we’ve been to there were still plenty of visitors milling about willy-nilly so you need to be watchful for people (and wildlife) that may appear before you around a sharp turn with little or no warning. There are also many road bikers who must be carefully passed in addition to negotiating the sharp curves. For someone who is afraid of heights, the trip can be quite anxiety provoking, especially if traveling West to East (on the outside lane) and if you’re the passenger. Frequently along the route the only thing separating you from precipitous drops of 1000 ft or more is a low stone wall! I also recommend traveling the road several times at different times of day as the light changes the views greatly. The 2nd time we drove the road was in the evening with the sun at a lower angle and not only were the colors more vibrant but subtler details (such as smaller waterfalls) stood out in greater contrast. I mentioned earlier that we unintentionally arrived early in the height of the season. While this assisted us in beating the crowds it also had the unintended effect of potentially providing more beautiful views. We were told by locals that it had been unusually rainy as of late and this along with late season snow/glacier-melt contributed to some incredible waterfalls cascading down the steep mountain walls into the canyon. As the season wanes these falls tend to dry up and become merely trickles. Many scientists believe the park will be completely glacier free by 2030 due to warming temperatures. I hope they are wrong about this as it will have profound effects on the various ecosystems that comprise the park. You’ll notice as you traverse the road that these systems vary from arid high plains on the eastern side…to alpine tundra at the summit…to temperate rainforest at the lower elevations on the western side of the park. Many of the lakes are fed by glacial springs and/or snowmelt from the long winter. If these glaciers dry up and/or less snow accumulates in the winter months to feed the lakes it’s possible they may dry up (or their water levels significantly lessen) as well. This will hinder the survivability of the vast array of flora and fauna that make up these ecosystems. There is already evidence that the warmer temperatures are causing an increase of foliage and subsequent treeline which impedes on the tundra. Many alpine plants grow only in tundra regions and could become endangered/extinct if these consequences are borne out to their fullest extent. This could have far reaching effects that can’t even be fully calculated at this time. Below is a picture from the Going to the Sun Road. This was taken near Logan Pass, the summit of the road at around 9,000 ft. Notice the narrow brick wall at the bottom separating the car from the dropoff!